Does Binge-Watching Make Us Depressed? Good Question : Shots - Health News Recent headlines make it sound as if watching just a few episodes at night can make us depressed and lonely. OK, more than a few. But the science on binge-watching is just getting started. 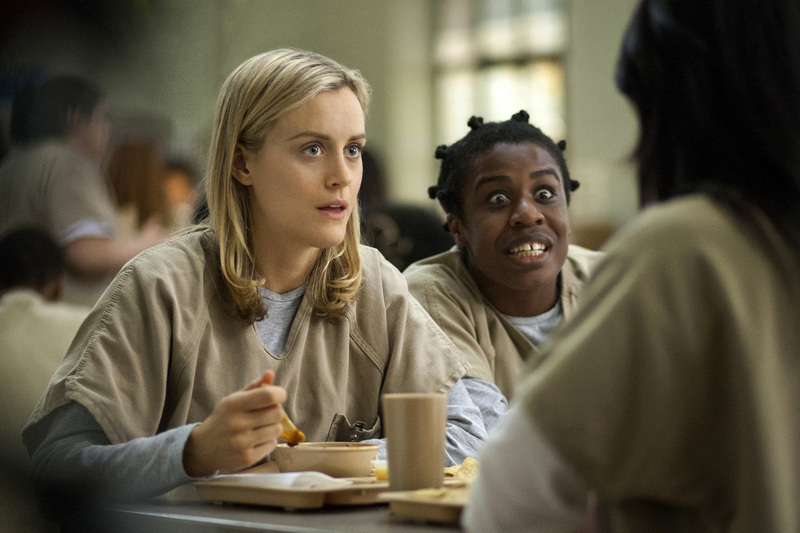 If 13 episodes in a row with Piper and Crazy Eyes sounds like your dream day, social scientists want to talk with you about your habits. Netflix and other streaming media services have become the crack of television, making it possible to watch an entire season of shows like House of Cards or Orange Is the New Black in one go. It seems like harmless fun, but recent headlines suggest that our binge-watching habits could be making us depressed and miserable. The most recent findings on binge-watching associated people who binge on television with depression, loneliness and an inability to control their behavior. "Our findings in our research show that those who feel more depressed tend to watch more programs," Yoon Hi Sung, a doctoral student at the University of Texas at Austin and the lead researcher in the study, tells Shots. But no one is actually diagnosing frequent watchers with depression. Of the 316 people who answered an online survey, 237 met the researchers' definition of binge-watching. They were more likely than the non-binge viewers to admit behaviors associated with depression, lack of self-regulation or loneliness. But the study didn't find that binge-watching will make you depressed, out of control or lonely; it merely suggests a connection. As with any new social phenomenon, scientists are scrambling to catch up with human behavior. And when it comes to binge-watching, researchers readily admit that they're not there yet. "I feel like this is just exploratory research," says Wei-Na Lee, a professor of communications at the University of Texas at Austin and the advising researcher in Sung's study. The researchers will present their findings at the International Communication Association conference in May. The problems with binge-watching research start with how scientists define how much television you have to watch to be bingeing. Sung, Lee and other researchers define binge-watching as watching two or more episodes in one sitting. But two episodes can mean dramatically different things depending on what you're watching. Binge-watching two episodes of Friends takes less than half of the time it takes to watch one episode of Sherlock. Yet with a definition based on the number of episodes, Friends is a binge and Sherlock is normal behavior. Once the researchers defined binge-watching, they set up surveys to see if people have the same response as they do to recognized bingeing disorders like binge-eating and binge-drinking. They ask participants questions about everything from their annual income to whether they're depressed. Since there are so many variables, that makes it hard to draw conclusions from small studies. Still, researchers think there's some effect. "You get this response that's very similar to the response from giving up food or substances," says Chad Bingo, a marketing student at Siena College in Loudonville, N.Y., who helped run a binge-watching study in 2014. "The side effects aren't there, but the feeling of needing it all the time is," he tells Shots. But the most confounding factor may be how fast the technology that lets us binge is changing. Consider the autoplay function on Netflix. When an episode ends, there's a 15-second pause and then the next episode in the season starts automatically. There's no choice in this behavior, which means it's up to the viewer to regulate themselves and turn off the TV. "For the most part we believe that the autoplay feature does encourage you to start new episodes," said Bingo. And this is one of the questions he has struggled with: When does a viewer cross the line from responding to design and into engaging in addictive behavior? In some cases, it's obvious who's a binge viewer. There are binge-watching pioneers who consume entire seasons in a weekend. "That's what we consider addictive behavior, when almost every weekend they get up at 9 in the morning and watch for 10 hours," says Bingo. But just because the behavior is unprecedented, that doesn't make it unhealthy. Raj Devasagayam, a marketing professor at Siena College who was the lead author of the 2014 study, is most impressed with the binge viewers' attention span, and how they can react to multiple story lines. "They're focusing on many different things at a high level," he says. He's not even sure that he can say that binge viewers are watching alone, because so many are contributing to online forums and engaging with other fans they have never met in person. "Just because I didn't [binge-watch] at my age or growing up, it doesn't mean that it's wrong."